More than 700 years ago Marco Polo wrote of a ‘great red island’ that was rumoured to lie off the coast of Africa. In his later (slightly senile) years, the great explorer named the island ‘Madagascar’; he was probably thinking of Mogadishu, but of course there was nobody around to correct him and the name stuck. ‘More elephants are bred here than in any other province,’ he reported. ‘They have leopards and lynxes and lion also in great number.’ Possibly influenced by the Arab folktales of Sinbad the Sailor, Marco Polo went on to describe a bird so huge that it could pounce on an elephant and carry it off to its nest. Since only 10% of Madagascar’s wildlife can be found elsewhere, it is not surprising that elephants, leopards, lynxes and lions are on that extensive ‘missing list.’ Strangely, the great explorer was much closer to the truth with his ‘elephant bird’ story. The aepyornis (9 feet tall and weighing up to 1,000lbs) is believed to have been the biggest bird that ever lived, though it would have had considerable problem flying…with or without an elephant in its talons. Even today, Madagascar is a place of bizarre creatures and strange stories and the traveller quickly learns to avoid preconceived ideas. The charismatic ring-tailed lemur has become familiar as ‘the animal ambassador’ of this largely forgotten island but the giant black-and-white Indri lemur – like a four year-old boy in a panda suit – was considered too strange to be true when sightings were first reported. The weird-looking fosa (the largest of only eight carnivores) is capable of climbing forwards down vertical tree-trunks and the ring-tailed mongoose is notorious for its habit of devouring its lemur victims face-first. The aye-aye – with its bat’s ears, fox’s tail, rat’s teeth and devilish hands that look like nothing so much as creeping tarantulas – was laughed off as a taxonomist’s clever hoax when the first body was presented to European naturalists. Add to this motley collection of wildlife such phenomena as the Giraffe-necked Weevil, the Hissing Cockroach, the Giant Jumping Rat and the Screaming Gecko and you begin to get an idea of just what a unique place Madagascar is. On the map, the world’s fourth-largest island appears like a gigantic, thousand mile long, aircraft carrier moored off the coast of East Africa. In fact it is only loosely tethered to the ‘Dark Continent’ and has more in common geologically with India which was part of a ‘Malagasy super-continent’ after it broke away from Africa about 165 million years ago. Since then the 250 miles of Mozambique Channel currents have done more to isolate the island from the rest of the world than the entirety of the Indian Ocean. To the newly-arrived traveller Madagascar still appears to have more in common with Asia than with Africa. From the air you look down to see mud-walled villages that are surrounded by a patchwork of lush paddyfields (the Malagasy eat more rice per person than any other nationality). Zebu-carts, similar to those in India, ply the red-dust roads and the attractive cafe-au-lait complexions and almond eyes of the Merina people – ‘The People of the Highlands’ – are reminiscent of the Malays. 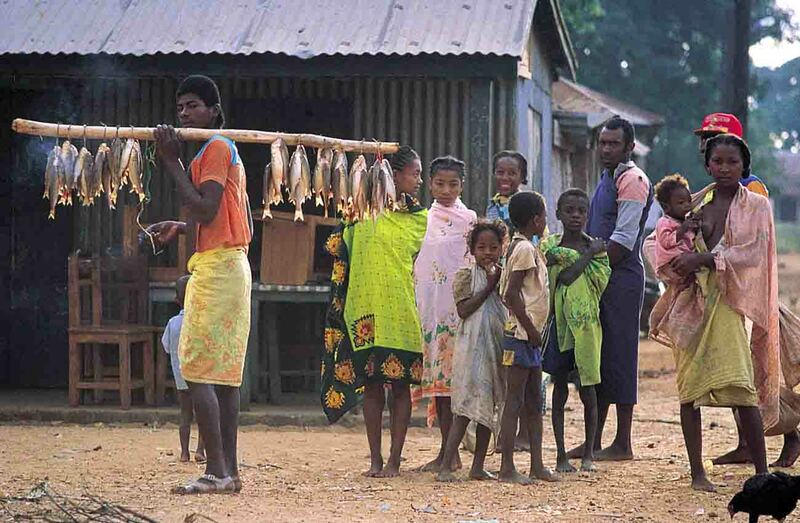 Madagascar has eighteen distinct tribes, each with their own homelands, culture, lifestyle and strictly observed taboos. Indonesian sailors were the first to settle on the island and it was not until much later that the pastoralist Bantu people made the voyage from the African coast. The South East Asian pioneers have left their legacy everywhere, from the outrigger fishing canoes, to the stilted bamboo huts, to their ecologically disastrous slash-and-burn agricultural system. The African’s brought a culture that was based on cattle and across much of Madagascar a man’s wealth is still judged in head of cattle. Within a short time of man’s arrival in this ‘Garden of Eden’ two dozen species of large mammals had already been hunted to extinction. The elephant bird soon fell to hunter’s spears or its nests were raided for the 8-litre eggs that could feed an entire village. The giant tortoise, the pygmy hippo and some seventeen species of lemurs (one as big as a gorilla) quickly followed Sinbad’s fabled ‘Roc’ into oblivion. Throughout the millions of years of its isolation Madagascar has experienced a virtual explosion of life that is unparalleled almost anywhere in the world. Mainland Africa is justly proud of its mighty baobab tree but Madagascar has eight separate species. There are 130 types of palms and over 300 reptile species (including more than 70 snakes and 63 chameleons). There are more than thirty species of tenrecs here (like long-legged hedgehogs). The key to the success of many of these is through record-breaking breeding: one tenrec can give birth to up to 25 offspring at a time and another is the world’s most precocious mammal, developing into sexual maturity within just 35 days of birth. The animals of Madagascar often seem to be completely unfazed by humans. This is less due to a traditional love for wildlife than because of taboos or a belief that many animals are actually the embodiment of powerful spirits. It is as if, on an island that has so few dangerous creatures, the early Malagasies felt compelled to invent their own fears. Walking around the Lake Antanovo in the far north you will see the sacred crocodiles, gorged and fattened on the offerings of local villagers who believe that the reptiles are the spirits of drowned people. Few Malagasy would harm a snake and consequently all over the island the serpents are unbelievably confident. Often they do not even bother to move off the jungle path when they hear you coming and you are likely to see more snakes in two weeks in Madagascar than you might spot in a lifetime in other tropical countries. You feel grateful that, among its other blessings, there is not a single snake here that is harmful to humans. Chameleons too are revered. Malagasy believe that because their eyes turn in all directions they can see into the past and many (like the 60cm long Parson’s chameleon and the tiny Brookesia, which is about the length of a human fingernail) were traditionally considered to be nothing less than deities. Reputedly masters of disguise, the chameleons of Madagascar seem to be either so tame or so bold that they are remarkably easy to spot. Everywhere you look they stick up from prominent branches like big green thumbs and, with brightly coloured day geckos also always on show, it is not unusual to spot a dozen different reptiles within the course of a half-hour stroll. Day geckos have been described as ‘the living jewels of Madagascar’ and the crown jewel can only be the Greater Madagascar Day Gecko – an eight inch emerald dagger sprinkled down its back with a dozen bright rubies. But it is the lemurs which are the real stars of this wildlife extravaganza. The presence of at least sixty-seven species of primates on a single island is enough almost to confound the laws of nature but, without competition from monkeys and apes, the lemurs were never forced to evolve beyond the stage of ‘primitive primates.’ Instead they specialised to fill every possible niche and habitat. The recently discovered Golden Bamboo Lemur is one of the most dramatic examples of this: it lives almost entirely on poisonous bamboo and each day it consumes twelve times the amount of cyanide that should kill an animal of its size. The Pygmy Mouse-lemur (not much bigger than a ‘pygmy mouse’) was – not surprisingly perhaps – also lost to science for over a hundred years until it was rediscovered in the early 1990s. Two hundred years later, travellers who make a safari to the ‘Great Red Island’ are still likely to return with a harvest of stories that their western contemporaries will find hard to believe. I like this article!- wish there were photos of some of them, maybe the 4 year olds in panda suits!